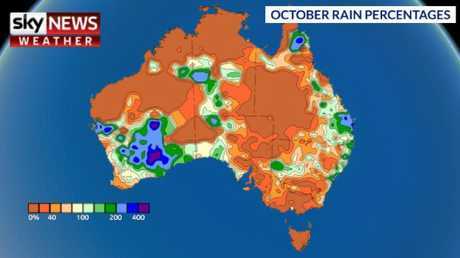 The maps that vividly shows how much rainfall Australia has received from September to October. Picture: Sky News Weather. REMEMBER that time a few weeks back when it had rained so little that the idea of a shower was like some distant childhood memory? Well that's all changed. In the past few weeks many of us have been surgically attached to our umbrellas. And that looks set to continue in many places for at least the next few days. Storms continue to barrel across particularly Victoria on Tuesday and Wednesday but also parts of New South Wales and Queensland. Two maps succinctly sum up the vast contrast in rainfall between September and October. 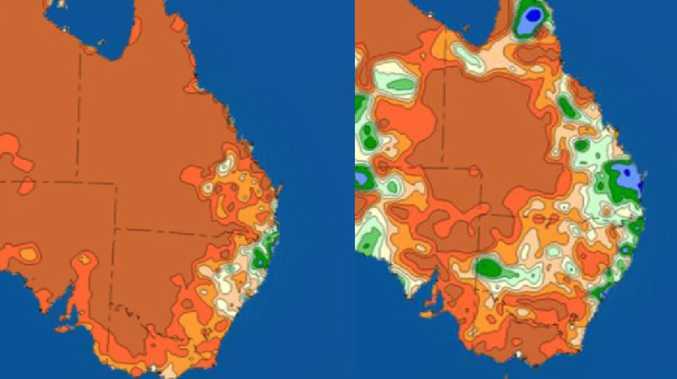 The maps show the percentage of rain that has fallen on Australia compared to an average month. In September, vast areas of Australia are coloured brown on the graph meaning not a drop of rain fell at all. Orange areas saw between 10 and 40 per cent less rain that a standard September. 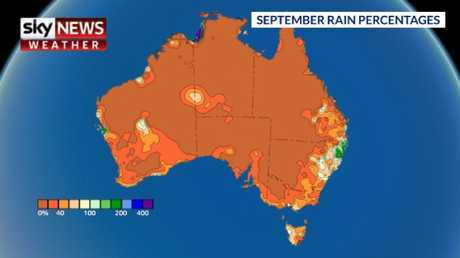 "In September, the rain was less than 20 per cent of the average while the average amount of rain across the whole country was just 5mm," said Sky News weather channel meteorologist Tom Saunders on Tuesday. But what a change a few weeks can make. "Last month was Australia's driest September on record but now it's rapidly becoming Australia's wettest October," Mr Saunders said. A rain percentage map for September shows how little moisture fell. The brown areas saw no rain at all. Picture: Sky News Weather. A look at the October rain percentage map shows much of the country had at least the average rainfall for the month while purple patches show where four times the usual has so far fallen. And it's only half way through the month. Broken Hill, in far west NSW, has gone from zero rain in September to 35mm, above the October average of 25mm. Kalgoorlie has received 10 times the precipitation it got in all September in just the past two weeks. Gympie can usually expect 66mm of rain in October. 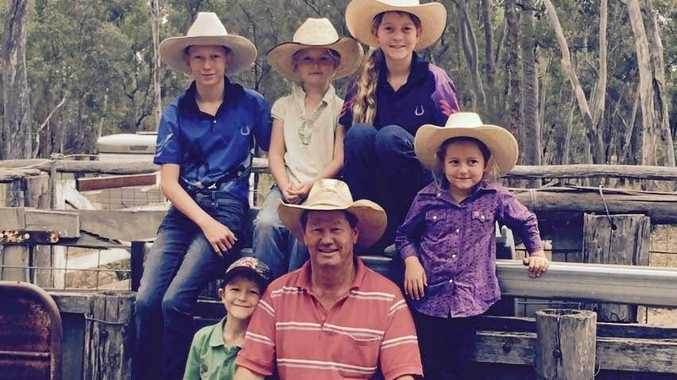 The Queensland town has gone from 13mm last month to an extraordinary 223mm since 1 October. Tewantin on the Sunshine Coast has seen a huge month-on-month increase in moisture from 74mm to 393mm. That means the area is now officially seeing its wettest October ever recorded. Brisbane's 135mm of rain is getting on for double its monthly average for October. Sydney has seen a similar soaking. But Mr Saunders said remarkable though the rain may seem, it was not a sign of things to come. "There is no global climate driver leading to heavier rain this month. It's just a wet month in what has otherwise been a very dry year," he told news.com.au. Indeed, there is now an increased likelihood of the El Nino and positive Indian Ocean Dipole climate systems moving out of neutral and that means the risk of less, rather than more, rain during late spring over most of Australia. That's bad news because despite a bumper October rainfall many inland areas are still hundreds of millimetres below their average annual moisture. One good month doesn't make up for a baking year. After a blustery and drizzly start to their Australian escapade, the Duke and Duchess of Sussex's smiles were almost as the bright as the sun that shone down on Sydney today. But the unstable conditions aren't over forecasters have warned. A long line of thunderstorms is stretching north to south from Victoria to the Northern Territory inland from the coast. This could mean Dubbo, tomorrow's stop on the royal jamboree, could see Harry and Meghan get soggy as storms pass over. There will be possible showers in Sydney for the next few days but as we move towards the weekend the moisture that is fuelling the instability should float off into the Tasman leaving far more settled conditions. Canberra is in line for up to 10mm of rain on Wednesday and Thursday. Showers in south east Queensland should start easing back but it will be stormy in western parts of the state. 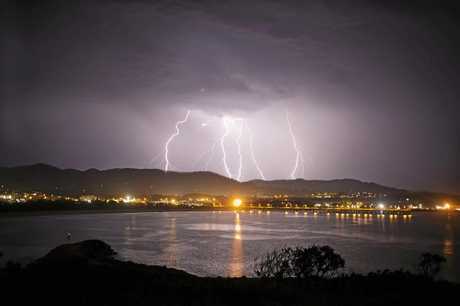 On Monday, South Australia saw 100,000 lightning strikes as a low pressure system battered the state on its way to Victoria. Today, SA is an oasis of clam after with possible rain only on higher ground. The same system has brought humidity to Victoria with a record two consecutive October nights of stuffy temperatures in Melbourne with the mercury not dipping below 19C, said Bureau of Meteorology meteorologist Keris Arndt. Rain and storms are heading across Victoria on Tuesday. "There's a whole lot of moisture being dragged down from the tropics which is something we haven't seen for a few months," Mr Arndt said. A severe weather warning for rain, thunderstorms, damaging winds and hail is in place for central and north parts of the state including Bendigo. Mr Arndt said the warning area could well be increased as the day progressed. Melbourne could see rainfall, and a possible storm, on Tuesday and Wednesday. Tasmania could be wet in the island's north but dry in Hobart. It's clear skies in Perth, with high of 29C on Wednesday but there is an extreme, even catastrophic, fire risk in the coming days for eastern and southern parts of Western Australia as a low pressure system from the ocean brings strong winds to the interior. Darwin is stormy and 33C. In October it has poured. Purple areas saw 400 per cent the average monthly rainfall so far. Picture: Sky News Weather.